Today, we were lucky to have a visit from 'THE INCREDIBLES' and a random unicorn. Students enjoyed the costume parade in the morning, scary stories after recess, and a Autumn Halloween celebration after lunch. Thank you to all students who were able to contribute to our potluck. You have a PAR HOLIDAY today, however, I want all of you to make sure you have a safe Halloween today. Don't forget about staying safe and the message the Vancouver Police Department gave you. 1.) PARENTS: Click here to sign up for your STUDENT / PARENT / TEACHER CONFERENCE. <------------MUST BE COMPLETED TODAY! 2.) 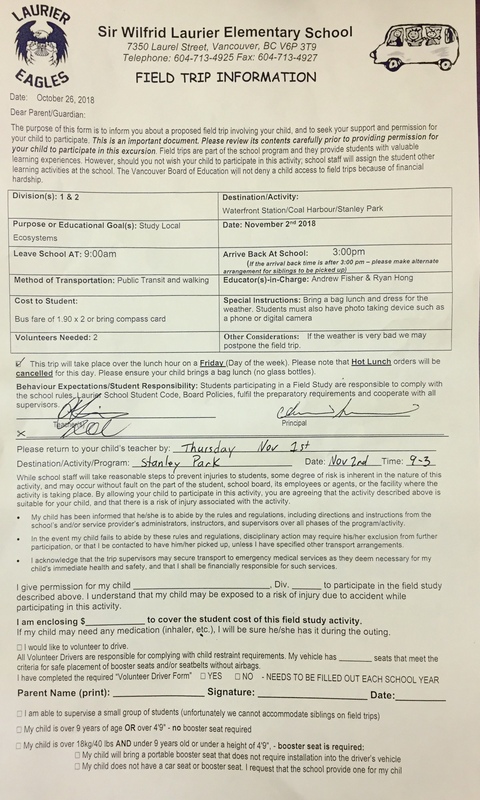 FIELD TRIP FORMS MUST BE RETURNED TOMORROW! (Ben, Dennis, Sameer, and Harmon). Complete booklet if you haven't done so already. Click here to download divisibility rules workbook with the answer key. Check answers at home. You have a PAR holiday! Today, you participated in a STEM Challenge with our Division 9 buddies! Your challenge was to create a structure out of Halloween candies and toothpicks. Many of you learned the base of your structure needed to be the most solid part of your creations. You used science, technology, engineering, and math to design your structures! You also helped your little buddies document the learning on FreshGrade. 1.) FIELD TRIP FORMS MUST BE RETURNED TOMORROW! 2.) List what you will be bringing to our class potluck lunch tomorrow. 3.) Wear your costume for the Division 1 and 2 costume contest to celebrate.......the FALL season. 4.) PARENTS: Click here to sign up for your STUDENT/PARENT/TEACHER CONFERENCE. Update your list below with at least 5 of your best questions. Include any useful resources you have found in your 'IMMERSION' phase. Click here to access the Gr. 6 Inquiry Question brainstorming page. Click here to access the Gr. 7 Inquiry Question brainstorming page. Complete a minimum of 4 pages and if you have time, complete all pages. Today, Mrs. Altman gave you a lesson on research skills. You learned about how to find reliable sources. Click here to view the infographic she showed you. Click here to visit a link to the Pacific Northwest Tree Octopus. Use your investigative skills to learn about the reliability of this site. In paragraph formate, use what you learned today to list and explain 3 points that tell you this link is reliable or unreliable. Do your best to list points that have not yet been fully explained by another student. We understand there will be some repetition here, but your reasons should be in your own words. Ask one student about a point they never mentioned and ask them to explain what they think. Today, the students learned a new reading strategy. They learned how to 'MONITOR COMPREHENSION'. Click here for a list of the reading strategies the students will be learning this year. They learned they can stop & think, reread, slow down, read ahead, read out loud, look at text features, identify sources of confusion, get more background knowledge, ask questions, or talk to a friend/parent/sibling/or teacher. All of which can help them understand something they are unsure of. Students will build on each of these strategies to become proficient 'READERS'. 1.) MATH: Complete divisibility rules booklet if you didn't finish it in class. Make sure you have plenty of questions to work with for inquiry tomorrow. Do your best to bring something made at home. List your first name, item you're bringing, and the amount you will bring. In a standard paragraph (intro, body/supporting sentences, and conclusion), write about the video you just watched. You must use one of the types of introductions/hooks/leads on the following link. Click here for examples of different types of hooks. Be sure to write about how the video made you feel at the beginning, middle, and end. Give two students suggestions about their 'HOOK/INTRO'. Edit/revise your original post based on self/peer assessment. Today, the students were privileged to have an opportunity to learn about African culture from Jacky Essombe. She shared part of her culture from the country of Cameroon. Students learned a song and several different dance moves. They were able to keep with the rhythm to create a very rhythmical song and dance. Here is a link to Shakira's version of this song that was made to celebrate World Cup Soccer. Click here to see what the students did on Friday! Based on the snapshot of the learning reflection criteria, update any FreshGrade activities that you have not yet updated. Watch this video with your parents. Two days ago, we read 'BE WHERE YOUR FEET ARE'. Using your 'VOICE', tell your parents what you think the 'BIG IDEA' or message of both the video and book are. This book had a message that is similar to the message from today's posted video. Write a standard paragraph or mini-essay on what 'Mindfulness' or 'Being Present' means to you. Include an intro, body/supporting sentences and examples, and a conclusion. Pay attention to the givens: spelling, capitals, structure, grammar, an punctuation. Mindfulness for Kids: What does being present mean? Click above to read post card. Today, we received our first post card from a student in Pennsylvania. Through social media, we have had many opportunities to connect with students from across the globe. So far, we have connected with students from several areas of the U.S.A. and from Sweden. Click here to read the responses from some of these students. Div 1 and 2 students, feel free to add to this Padlet if another student has asked a question.​ The Global Read Aloud has helped us learn from others. Complete your Word Work assignment for tomorrow. BE SURE TO HIGHLIGHT or CHANGE THE COLOUR OF THE WORDS from the list in your story. Follow instructions on this Google Slideshow and add to your slide. Quiz tomorrow on spelling, definitions, and word usage. Read through some of the stories written by your classmates on the Google Slideshow. Post descriptive feedback for them on today's PAR. Your suggestions should include 2-3 points they need to fix. Be sure to include word usage, spelling, or grammatical issues. Edit/revise your slide on the slideshow based on your peer assessment or self-assessment. Tell Your Parents About the Book! 1.) SOCIAL STUDIES INQUIRY: Have your list of questions ready for tomorrow. Click here to watch the video we watched in class today on the 30 Articles of the Universal Declaration of Human Rights. Click here for a pdf with more information about the 30 Articles of the Universal Declaration of Human Rights. Some of you started your math inquiry into divisibility rules yesterday. You will all continue this in class tomorrow with your small groups. Your post a response today is to work on your word work. Click here for this week's word work instructions. Today, we did a lot of learning! So much that Mr. Fisher and I were still very excited at the end of the day because it was so amazing! We had a unique opportunity to connect with a class from the U.S.A (﻿Frankfort, Illinois﻿) by having a Mystery Google Hangout with them! It was amazing to see how powerful technology can me in our learning. We learned questioning, geography, communication, and collaboration skills. Learning together is extremely powerful. it is important to learn and hear different perspectives to have a better understanding of a topic. Later in the day, we wrapped up our mini-inquiry unit and ended it with an amazing cheer! "When we inquire, we're on fire! The Learning Never Stops!" Today, we had our first Mystery Google Hangout with a class from Frankfort, Illinois. Visit their tourism page and watch this video of their historic downtown. Write a paragraph about something you learned from researching this page. Include an intro, body with examples/supporting sentences, and a conclusion. Pay attention to the givens: spelling, capitals, punctuation, grammar, and sentence structure. THIS WILL BE EVALUATED ON FRESHGRADE. You must post, give peer feedback, and edit/revise based on the peer feedback or a self-assessment. Today, the students were engaged deep in their learning during Physical and Health Education during our Gymnastics class. They engaged in self/peer assessment of their abilities and skills. Later, the Gr. 7 students completed 2 sections of the FSA's. They will be writing more of the FSA later this week. During the global read aloud, we discussed many different topics and themes that have come up. We have posted a Padlet board here for the students to respond to questions. Complete pg. 84, 85, 80, and 75-76 if you did not complete this in class. Colour your french t-shirts for tomorrow. Feel free to cut it out as well. Click here to visit our PADLET to complete tonight's post a response assignment. Mr. Fisher and I have posted questions related to the ones you came up with in class today. Read our examples and model your responses after the structure of ours. Feel free to write your response to any one or two of the questions. OPTIONAL: You may also post a question that you have related to each of the questions we have posted. Make sure to post in the appropriate column by click on the '+' sign. I voted in the civic elections! ​1.) MATH: Any unfinished work. Log into your FreshGrade and make any updates as necessary. (Reflections, responding to comments, uploading work, etc). Of course your learning reflection criteria should be based on the criteria you created in class. Click here to review the post about learning reflections. Watch this video. We will do an activity with this tomorrow morning. Yesterday, I voted in the Vancouver city civic elections. I voted for who I believe will do a good job running our city, parks, and schools. Click on this link and read through some of the common issues that come up during election time. This will give you some background knowledge and information that will be useful for your paragraph. Talk to your parents and ask them why they think it is important to vote. In paragraph form (intro/topic sentence, body/supporting sentences and examples, conclusion), explain why you believe citizens should vote in all elections? Include at least 2 examples in the body of your paragraph explaining why voting is important. Welcome to the October 19th Provincial professional development workshop! While you wait, please complete this pre-assessment survey. 1.) Teachers, please click here to complete the pre-assessment survey. 2.) Teachers, please ONLY click/complete the post-assessment survey at the end of the day once you have completed the workshop.